For about two years, I have outlined that the OPEC/Russia oil production agreement would be successful in reducing oil inventories. I have further made the case that oil demand would continue to rise in the short term, oil supply could face disruptions and that the price of oil would rise to around $80 per barrel by this summer. We are at the doorstep to $80 now. The takeaway from these discussions is that this week could be investors last chance to add oil company stocks that have trailed the 50% move up in oil prices recently. There is also an opportunity for investors to invest directly in a further rise in the price of oil. If President Trump lifts the relief from sanctions on Iran which were granted as part of the nuclear deal, the time clock on saving any deal starts ticking. The potential for an Iran conflict also moves closer. Under the terms of the nuclear deal, there is a dispute resolution clause that any party can trigger if it feels another party has violated terms of the agreement. It is not mandatory however. The real clock is the 180 day clock that starts which would target banks of nations who do not reduce their oil purchases from Iran within six months. This is the item that I discussed in President Trump Just Signaled The End Of The Nuclear Deal With Iran And Higher Oil Prices. There is this idea on the internet that other nations can simply ignore the U.S. position on the Iran deal and continue business as usual if they choose. That is not true. Not only will pulling the waivers on sanctions against Iran terminate the JCPOA in every effective way, but the impact on banks who do not comply with the sanctions would be onerous. “…They provide for penalties against those who conduct transactions with Iran’s Central Bank (as well as other Iranian banks if subject to U.S. sanctions) unless the countries in which those banks are based have reduced their purchases of Iranian crude oil by a significant margin over the preceding 180-day period. If a country has made such a reduction, then it is eligible for a sanctions exception and transactions can continue. This exception is important because without it, oil and gas trade with Iran is immediately subject to U.S. sanctions. Iran requires that its Central Bank process these transactions, as it considers oil and natural gas to be state property. If you can’t do business with Iran’s Central Bank, then you cannot purchase its oil or gas if you want to keep doing business with U.S. banks. Ultimately, the increases in oil exports from Iran seen since 2015 are all at risk. That could amount up to 1,300,000 barrels per day of oil coming off of international markets by year-end. The actual number is likely to be a bit lower, as various experts peg the number at about 900,000bpd – still a dramatic reduction in supply. 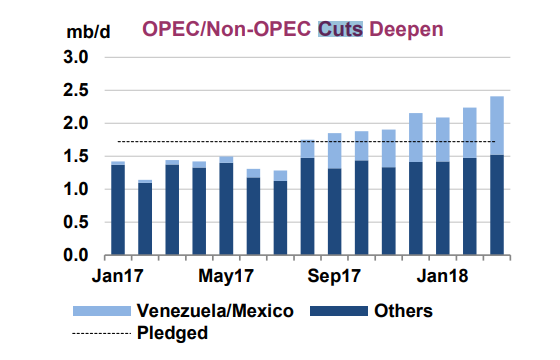 Compliance with the production limits of the OPEC/Russia deal have been projected as high as 106% and 149% in recent months. That means they brought off more than agreed upon at certain times. The compliance rate has been around 100% throughout the deal. Certainly, it is important to consider that the “cuts” were initially more of a freeze following a rise in production. That has changed to account for real cuts as disruptions in Venezuela, Angola and various fields have occurred. 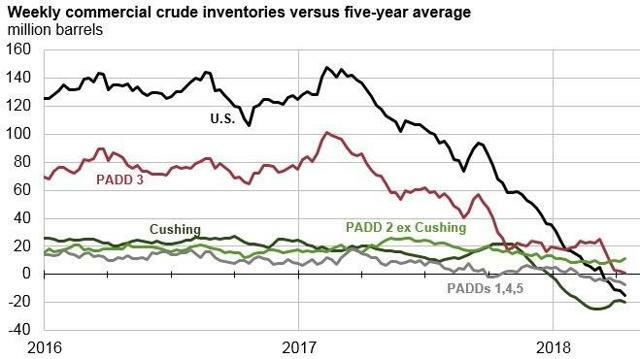 As you can see below, not only is oil demand outstripping supply, but inventories have fallen for seven consecutive quarters. I would anticipate that inventories fall for at least next two quarters and possibly more as we enter the summer driving season and the likelihood of the Iran sanctions coming back into place. U.S. oil inventories just dropped below their 5-year average. This defies any seasonality and has a clear implication on the price of oil, gasoline, diesel and jet fuel. I got a lot of arguments on those points. The first point, that deep water oil is doomed, revolves around the long cycle nature of deep water oil in the face of the eventual rise of electric vehicles. The simple logic is that financing for projects that take the better part of a decade to pay back would not be done in most cases. That has absolutely proven to be true. Around the world, from Angola to Southeast Asia to the North Atlantic to South America, deep water production is barely hanging on through improvements in technology to squeeze every last drop out of existing wells. New development has sunk like a drill bit in the ocean though. Companies like Halliburton (HAL) and Schlumberger (SLB) have reported massive declines in offshore projects globally. They have had to adjust budgets and bring people back as the oil markets rebalanced. 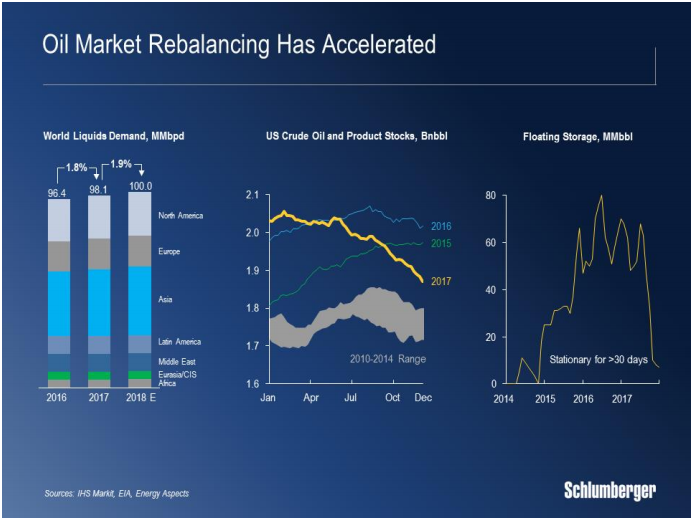 Schlumberger recently noted that floating storage had been virtually eliminated in the past year due to increasing demand and the impact of OPEC and Russia’s production limits, as well as, subdued deep water development. Many oil bears and those who hope that oil would be cheap forever cling to the notion that American oil shale can produce all that increasing demand requires. That has never been the case and never will be. U.S. shale has been high-grading (getting the best and cheapest oil first) for years now. The cost of oil extraction in most of the major plays is drifting upward, not downward as some would have you believe. Already, virtually all of the increase in U.S. oil production is limited to the Permian Basin and the gulf of Mexico. The Bakken located in the Williston Basin of North Dakota, which I visited in 2012 and 2013 during its prolific boom, already is showing zero growth as fields are used and oil is more expensive to extract, although the recent opening of the Dakota Access Pipeline appears to have stirred a bit more production according to a recent EIA note. With deep water oil falling off a cliff in many parts of the world, it is interesting to note that the Gulf is doing fairly well. This is in large part due to a reduction of lease costs from the Government in the shallower plays. In essence, the Gulf is being high graded as well, the easiest and cheapest oil is being pumped as fast as possible – this situation won’t last. In the Permian, there appears to be at least several years of growth available. New infrastructure is being built by the likes of Kinder Morgan (KMI) and Viper Energy (VNOM) to move oil and gas out of the region offsetting what had become a transportation glut. Even with the Permian and Gulf output still growing, total American oil production seems to be coming up against hard limits. In recent months production growth has slowed after a fast start to the year. From the first week of January to the first week of February, production rose from 9,492,000bd to 10,251,000bd. As of the third week of April, production has grown to 10,586,000bd per the EIA. While that is still growth, it is a much slower rate. 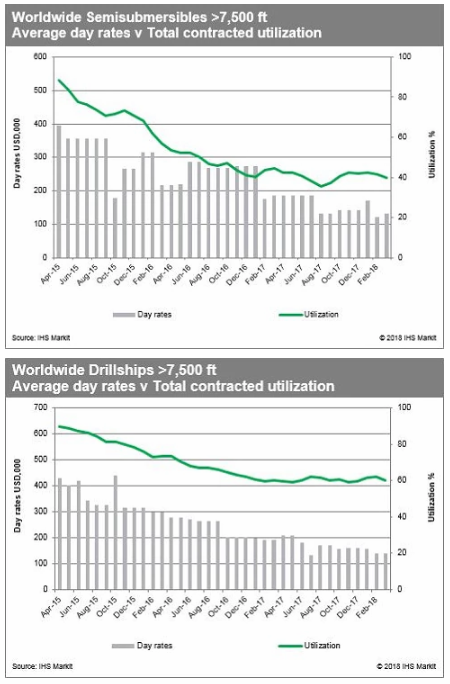 While, production appears headed to 11mbd by year-end, however, I am sticking with my forecast that production peaks at about 12mbd in 2019-20 as the most economical drill locations are used up. This won’t be enough to keep up with growing demand. While I do believe in the EV and hybrid future for automobiles, as I discussed in this Editor’s Choice article, Tony Seba, EVs, Solar And $25 Oil, the future is still about a decade or more away. In the meantime, oil demand will increase by 1-2mbd per year for the next several years. I fashioned this chart by extending on an EIA projection, which already turned out to be wrong as oil demand remains ahead of supply. As you’ll see, I show that demand should outpace supply for several years. This is largely due to the factors I have described above. The result of permanently stalled offshore development, limits on shale, disruptions and the influence of Saudi Arabia is that supply will be able to be kept under demand until that time, i.e. 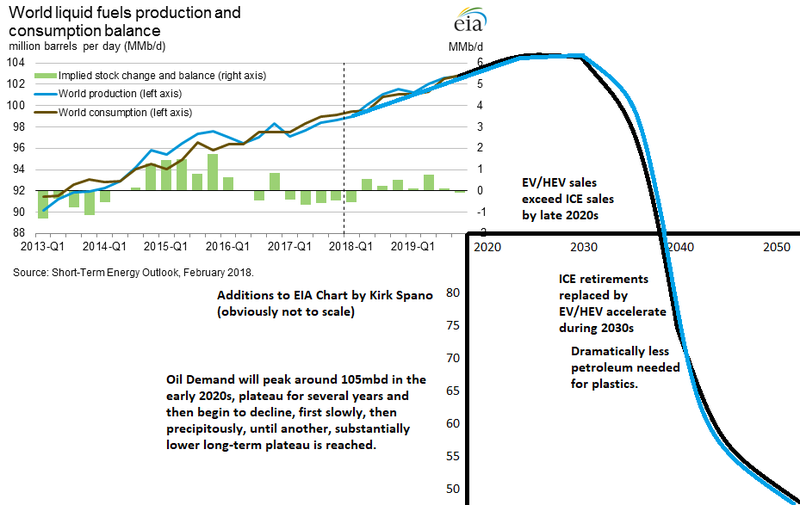 late 2020s, when demand for oil really starts to fall. 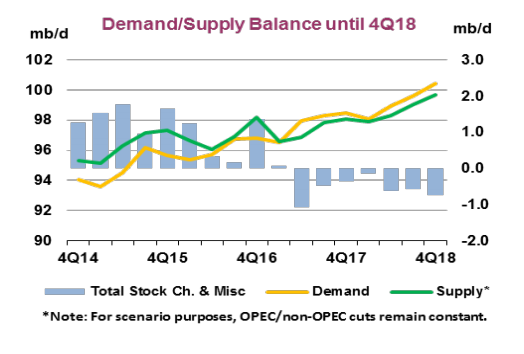 Once oil demand starts to fall, then supply will be allowed to rise above demand. Why? In order to lower prices for oil in order to slow the decline in oil demand. I do believe that by the late 2040s however, demand for oil will fall roughly in half from current levels. For the next decade however, oil investors should have it good in the “Last Great Secular Oil Bull Market” that I announced last October. Warren Buffett has been called a great “asset allocator.” I think that most investors overlook this vitally critical component to investing, instead focusing on chasing high flyers or fat dividends without regard to where an investment is relative to the economy. A profitable asset allocation is built by over weighting asset classes that will outperform the index and under weighting those that will trail. The construction process for building an asset allocation begins with an understanding of what the market is. 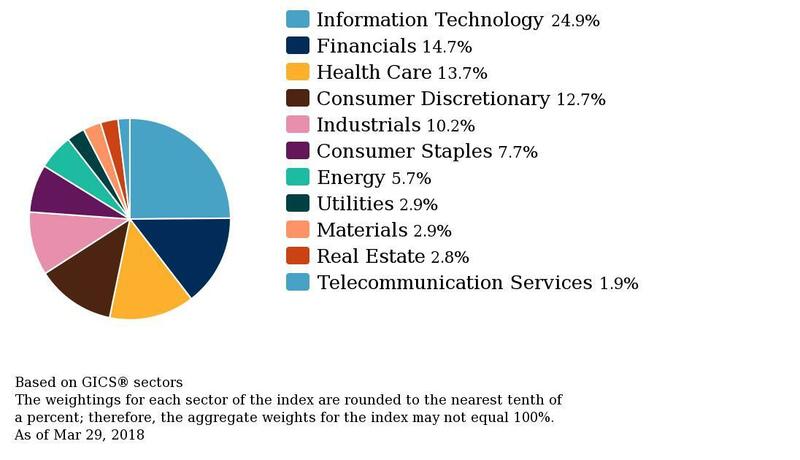 Here we see the breakdowns by sector for the S&P 500. By reducing holdings in lower growth and over priced sectors, while increasing weighting to higher growth and more value priced sectors, we can help long-term performance. 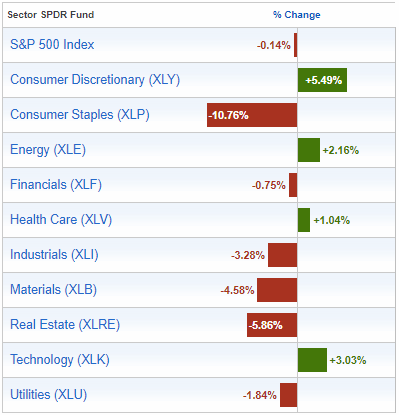 These asset allocation shifts do not have to happen often. A more aggressive trader will make a few tactical shifts per year tweaking weightings. A position trade might only adjust the asset allocation a few times per cycle over a period of years. Regardless, there are some clear signals to watch for. A very important signal to watch for has to do with capex. When an industry bottoms and a lack of investment in new products and services, that points to a higher profit margins for remaining suppliers in the future. This is the case for energy now. As you can see from the chart above, simply reducing consumer staples at the start of the year while increasing discretionary would have helped. Subtle shifts are often the name of the game. Sometimes, however, it pays to be more aggressive. Right now I am recommending a large overweight in energy. Currently, energy makes up 5.7% of the S&P 500 index weighting. However, I am recommending that investors hold 15-25% in energy, with certain enterprising investors holding a bit more. If energy stocks rally, investors can capture excess gains. I recommend reducing real estate (on interest rate and property price concerns) and healthcare (on regulatory concerns) holdings to add energy. For enterprising investors (if you don’t know what I mean when I say enterprising investors vs intelligent investors, please at least read a summary of The Intelligent Investor by Benjamin Graham), I am also buying long-term calls, LEAPs, on XOP at various strike prices. I rarely outline the aggressive trades on the free side of Seeking Alpha, so here I will warn you, there are moving parts here to understand before using this trade. Given that I believe oil will rise to about $80 per barrel by July, I am buying calls on USO in accounts with the required risk tolerance. To my mind, there is no point owning USO outright as oil company stocks likely have at least as much upside. The reason to buy calls on USO is that a rise in oil prices generally, is more certain than the rise in price of any stock or group of stocks. Therefore, I would like to get some leverage on rising oil prices. I am buying August calls on USO that are near the money. The $14 calls have significant volume and are easy to trade. Start there for a percent or two of asset allocation if you have the risk tolerance.